In this part I will be talking about the importance of the financial analysis and the practicalities of putting the figures together. 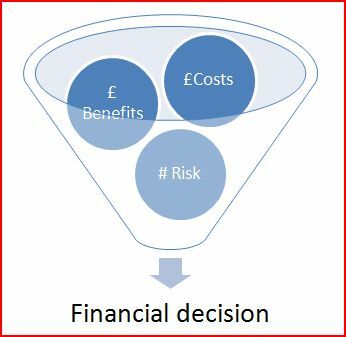 After all the bottom line in any business case is going to be financial although individual stakeholder priorities and concerns will play important parts as will the organisation’s history with similar projects and even good old office politics will often play a part. At this point I would caution that despite the importance of the figures, it would be foolish to present a business case without taking into account the stated aims of the business in it’s short and long term plans and the key performance indicators and critical success factors of the key stakeholders. If you are able to tie your benefits very clearly and distinctly to the corporate goals and to the personal KPIs of your individual stakeholders, then you stand a much greater chance of getting their attention and you may even be able to enlist their help in fleshing out your arguments. You will also have an opportunity to spot delicate or contentious areas that are best played down or avoided. Quantifying and presenting intangible benefits. The reasoning behind our approach is simple. Ultimately, your business case is about costs versus benefits so a good estimate of costs is critical alongside of a realistic estimate of benefits. The majority of projects bring benefit that are not easy to measure in reduced costs or increased profits, but are nevertheless important and valuable. Given that some benefits are easier to hook and land than others, it makes perfectly good sense to have an indicator of how likely you are to succeed in delivering the benefits and to stay within cost estimates. This way you are able to cherry pick the projects that suit your organisation’s current appetite for risk and you have an option to delve further into risk management if the potential reward is particularly attractive. It is important to position your business case and calculations correctly from the outset and to put in the appropriate level of analysis and checks in collating the figures. This activity will begin as an outline business case offering your best estimates based on hard data where available and tacit input from key stakeholders to fill the gaps and make adjustments where appropriate. This type of estimation is often described as stake in the ground, or Rule of thumb estimation. It’s purpose is to decide whether a initiative is worthy of pursuing further. In a way this is a business case for the business case. Later after you have received approval to proceed, you will continue to refine all the estimates until you arrive at a baseline part of the way through the project. Rule number one; Unless you are trained in financial analysis, put somebody else in charge of this part of the work and act as the collector of data. If you can’t delegate it then you are still going to need close cooperation from the finance department to get access to key numbers and you will need them to scrutinise your figures before you show it to anybody else. If nothing else it stops them playing fast and loose later when they own the inputs. The financial benefits can generally be described as either of; Cost avoidance, or Increased revenue. These events have very similar effects on Return On Investment (ROI). A key measure for most organisations will be ROI and a simple viewpoint can be that the project represents an investment of capital in the hope of achieving better returns than it could achieve elsewhere. One of the options for investment of retained capital would be the equities market though the key indicator here is the organisation’s Cost of Capital. This figure is unique to every organisation so you need to find it out. First you need to do some good old stake in the ground estimating of costs. Use as many reliable and respected opinions as possible to get ballpark figures at the start and refine this with as much verifiable data as you can get hold of. You can also try some online tools like Gartner TCO analyst, WIPRO TCA tool, or a number of services available online. Look through old project budgets if you can and learn from experience to make sure that you don’t leave important costs out. Nothing can erode your credibility quite like having a glaring omission pointed out to you in front of the board. If you are estimating costs for a new CRM system for example, you can begin with internet research and you will find detailed case studies and benchmark costs there, which give a very useful starting guide once you factor in comparisons of scale and other knowns. Next you can look at the organisation’s history of delivering similar projects. This is a critical sanity check, because not all organisations have the same capabilities and you need to estimate realistically. Look at similarly sized projects and similarly complex projects and look for overall time, scope creep, cost escalations and the obvious areas of weakness. if you have time and opportunity, compare the cost of past projects at this firm with estimates from the aforementioned tools and calculate and adjuster figure. E.G. you may find that they have consistently delivered at the gartner TCO rate times 1.2. Typical project deliverable are a useful way of making sure you cover everything; Project planning, management, requirements analysis, licensing, etc until you have a comprehensive list. You will then need to separate the ongoing costs from the capital costs. E.G. Support, annual licenses etc. In the case of an IT investment I would generally expect to have three columns in my spreadsheet to cover three years going forward. Now total up all of your costs for each year and make sure to account for indirect costs with a best estimate. Once you have finished calculating the costs, you can begin to calculate the tangible benefits. In most cases this is a fairly simple set of calculations such as 20% reduction in returned goods. cost of a single return = n total saving p.a. = n * 20% *average returns level. Always remember to do simple cause and effect analysis to determine what extra benefits might accrue that could be included and to be aware of any adverse effects that might result. The approach should be the same as with costs, the more collaboration you do, the more believable your results will be and the more buy-in you will get. Bit by bit organisations are coming to accept that intangible benefits are important and should be measured and accounted for. The difficulty is that measurement is as yet not a science and the responsibility of signing off large budgets without measurable benefits is too great for many senior executives. The reality however, is that intellectual capital, the real classification of these intangibles is a major part of the capital of every organisation and becomes especially noticeable when valuing a business for sale or valuing an equity. The business with an innovative loyal staff, an attractive location and great reputation is infinitely more valuable as an assert than an identical organisation without these attributes. Above is a view that illustrates in a very simple way the part played in an organisation’s value by intellectual capital. The type that might be dismissed as intangible unless you make the attempt to represent it correctly. One area where some progress has been made is the company Brand. E.G. A favourite areas of disagreement used to be the expenditure on building and maintaining a brand. CFOs were reluctant to sanction spending on what they often saw as “pink and fluffy stuff ” that delivered nothing at the bottom line. Recently Coca Cola had their brand revalued to $67.5 billion dollars and you can bet your last dollar they are acutely aware of it. Today it is easier to get a formula for calculating the value of the brand than it is to get a sensible definition of what a brand is, so don’t be put off by apparently intangible benefits. Tackle them and tame them. Take the same approach as brand valuation, I.E. how much more would the business be worth with a better reputation in the recruitment market and first call on the brightest talent. This type of calculation can be easier to do than seems apparent at first. If you can get hold of competitive analysis reports it will be easier still because the strengths and weaknesses of immediate competitors will be listed there and you can aim right at the bulls eye. Once you have made an estimate add a sensible confidence level to it and run with it. Once again, remember to be collaborative and to bear in mind the language and culture of the ionisation. Identify a KPI that will be significantly affected by the benefit and discuss it with the owner of that KPI. Perhaps the HR director is tasked to reduce staff churn and has a KPI measuring this. Ask her to help you work out the value to the business of improving that KPI by 1 point. Armed with this estimate, predict how many points you expect to improve it by and then calculate the financial benefit. Again apply a sensible confidence metric. Now that you have done the figures it is a simple matter of presenting them in a table so that they can be easily evaluated. In my example you will notice that I have included my confidence levels on a separate row so that the reader can take whichever view point he/she wishes. The only calculation we use in a standard business case is the NPV. This represents the Net Present Value of a sum of money, I.E the value of that money in today’s currency after factoring in Cost Of Capital. E.G. It is infinitely better to have a pound in your hand today than to receive it in three years, because it will purchase less in three years. In the NPV calculation we use the same thinking except that rather than inflation we use a Discount Rate that is based on cost of capital, because to better represents the investment options for that capital, it is key to get the cash flows right i.e. to work out a benefits schedule, because you need to know when cash is coming in and going out if you are to calculate NPV. Once you have this in place you can use the NPV function in Excel to calculate the NPV for you. The Payback period is a straightforward and obvious calculation and the Internal Rate of Return (IRR) is just an interest rate representing the return on the investment of capital. Ask your contact in Finance for these figures even if you feel you are perfectly capable of doing it yourself. As you will have noticed we built the risk analysis into the individual calculations as opposed to applying it to the whole calculation at once. If this is a sensitive area, then it is a simple matter to calculate these elements as an overall cost risk and overall benefits risk and look at best and worst case scenarios. At this point we have a fit for purpose financial proposal and now we need to set about optimising the presentation.